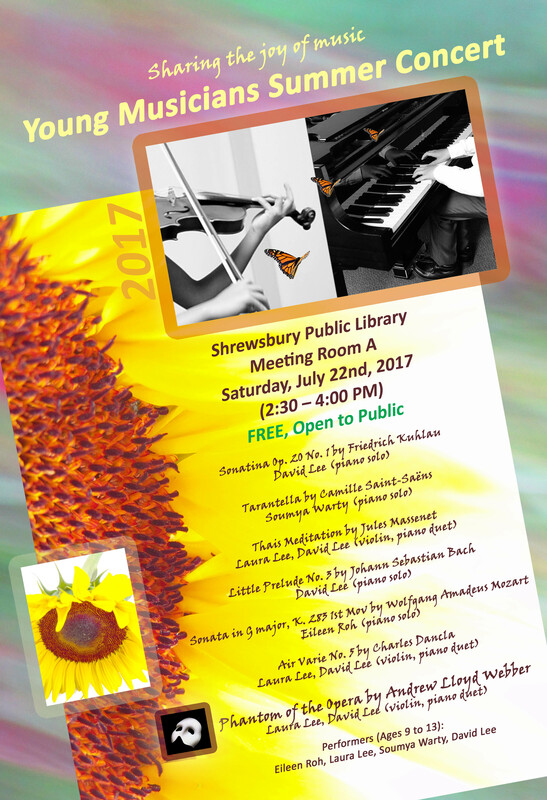 On Saturday, July 22, from 2:30-4:00PM, my sister and I will be performing in a free public concert at the Shrewsbury Public Library! Two other young musicians will also perform. The concert will be held at the library’s Meeting Room A. Our concert’s repertoire will include 7 pieces of beautiful piano and violin music by world famous composers (including Mozart, Bach and Andrew Lloyd Webber). Yes, Phantom of the Opera is on the list! The concert program is presented below with YouTube links to video examples of each song.